Sprue Cutters Union #9 - which paint(s) do you use? A nice and simple topic, which I'll try and make as complicated as possible. In the beginning there were enamels. Only enamels. Enamel thinners cleaned the brushes, and sediment built up at the bottom of the thinners bottle. I didn't thin any paints back then, but I did stir them in the tins with a toothpick. Humbrol tins. Don't spill contents on the carpet. At the time, I was only building 1:72 military flyers - usually ones I could find at my local news agent's store. I'd buy the paints and brushes there, too. If I was allowed, I'd go to Beatties and get supplies. Shame that they went out of business. Modelzone took over a lot of their stores, but it's not the same. After trip to the States as a teen, I bought a Testors Harrier model, and some enamels to match. Didn't like them much. Kit was average. Then acrylics started to appear on the scene. First up were some transparent acrylics from Humbrol that were meant for car lenses and other glass - very useful on my old Enterprise D nacelles and warp dish. I found a glow-in-the-dark acrylic for windows and a silver-based, electrically-conductive paint for the electronics in that model, too, so I could do without wires along the body. Neither were very successful. It was at this point that I started priming with spray enamel. I still have a ruined Star Trek Voyager model with an uneven 1/4inch of grey spray on the main saucer. I learned a lot from that. Not least that stripping paint is hard work, if not impossible in most cases. Then came the GW models. Lead and plastic, primed in the GW blue or black spray acrylics. I also bought a load of the original Citadel-branded Coat D'Arms paints. There were a couple of starter sets that I had - one with a dragon on the cover (but lost in the mists of time). These were nice to use - I only needed water to clean my brushes! The paints went on straight from the lid - as thinly as I could manage. No useful internet to teach me about wet palettes or milk-consistency paint! There was a feeling at the time, though, that acrylics were the poor-man's option. The pigments weren't as good as enamel - at least that's what I was told by the shop assistants. Then I took a break from models from a few years, and when I returned to the hobby, things had changed. A lot. Airbrushes were everywhere, wet-blending was an important thing to learn, and the previous 'advanced' technique of drybrushing was a now considered by many aficionados as a beginner's crutch. Today, I'm still using the Vallejo model colours, but more and more I'm using their Model Air range - even for brush work. I've bought back into the GW range, too, although I don't like spraying with them. The Tamiya acrylics rarely get used, apart from the flat black, which is amazing. 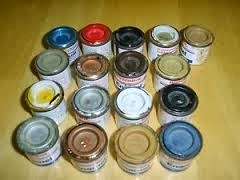 I still use the original Coat D'Arms pots where I can - the paints are brilliant, the inks/washes are really strong, and the metallics are good for brush work. I started painting the GW Mines of Moria box set with the included paints. They're bloody awful - like poster paints, but I set myself the challenge of finishing the Fellowship of the Ring with nothing but those paints. There's no blue. How can I paint the Hobbits without blue? GW's new paint range is rather annoying, however, but after a year I'm getting used to it - the names have changed, the colours aren't quite the same, and the pots are rubbish - they don't close easily, and are prone to drying out. The paints themselves are useful, though. They even go on "without the need for thinning", as a staff member told me. No thanks, I'll thin as usual. The pots at the back came with the Mines of Moria boxed set. I got bombarded with emails for Lifecolor acrylics, so I tried out the fleshtone set. Not had a good face yet. They have their own thinners, and dry so quickly you can't blend. Might try them with some acrylic medium at some point. I'm yet to try the Army Painter eyedropper range - but the colour primer sprays are amazing. If the acrylics go on as well, and match for colour, I'm sold. Alclad II lacquers are my favourite for any spray work. A coat of primer, then a gloss black, and then the metallic lacquer gives gorgeous coverage, and stunning colour. Mix and match different shades across a metallic surface, and you get one of the most realistic finishes on a scale model. 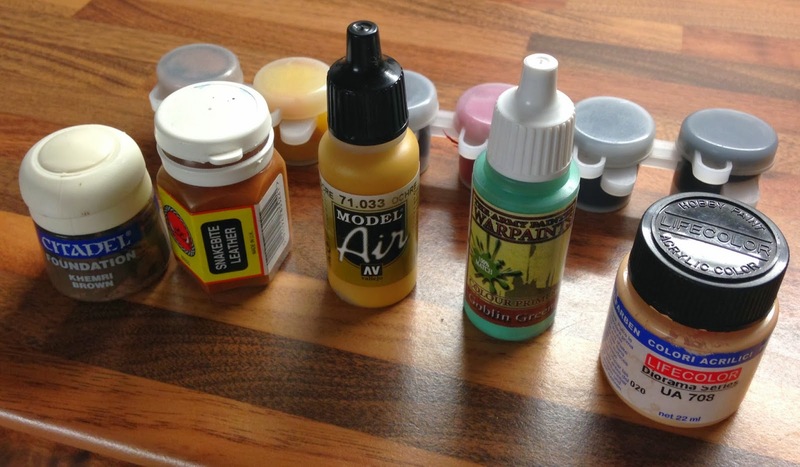 I also have a few of the Tamiya weathering powders, sticks and brushes. These are, admittedly, a hangover from feeling like I had to buy 'the right brand for the right job', but they're actually rather good. So, long story short: I use anything and everything. Don't get me wrong, I'll test first on sprue, on spare resin, and on bits of metal before committing to a proper model. I wouldn't want to screw it all up, now would I?